A recently conducted survey by Harris Insights, an analytics firm, discovered that 41% of Americans aren’t interested in investing in Cryptos such as Bitcoin, Ethereum, and Ripple, as they believe that nothing could get them to invest their income in the crypto market. Fortune indicated that the survey was entirely commissioned by Crypto App, Gem, which was seeking to know what could influence investors into the Crypto industry. While 41% rejected cryptocurrency, 50% indicated they would be willing and able to invest. 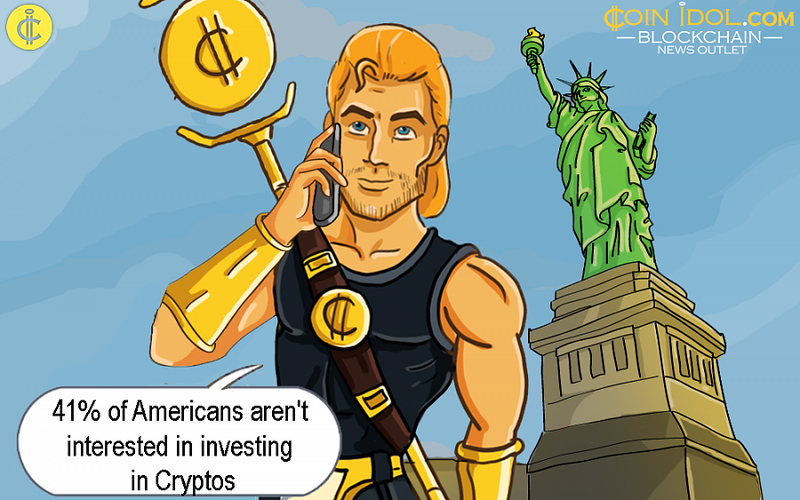 The survey that was conducted, polled 2,000 adults across the country, and further showed only 8% of Americans are already investing in Cryptos. According to Fortune, the figure is decorously minimal compared to 52% of Americans who own stocks. The survey also revealed that those who earn more than $100,000 annually are less likely to make investments in Cryptos, with only 6% owning Cryptocurrencies. 11% of those Americans earning between $50,000 – $74,900 annually unveiled they own Cryptos, while 7% is for those that earn less than $50,000 annually. Micah said that lower income households may be more prone to make investments in Cryptos because of a “get rich quick” mentality. The Crypto industry is “still in its Wild West Phase,” according to Micah, and those who have a lot of money have a lot to protect, and because of that, they aren’t willing at all to risk it. Lack of “understandable basic information ” leaves a lot of willing investors lagging behind, and if necessary information is provided to make them understand the industry very well, then 20% will be motivated to invest. 38% of UK’s investors don’t understand Cryptos very well and that 1/3 of the population strongly believe that the crypto market is in a bubble that can burst any time. Therefore, only 5% of those surveyed by IW Capital generated “financial gains” from their made cryptocurrency investments. These studies industriously come at a moment in which Bitcoin, the world’s number one Crypto, is regaining from a months-long bearish trend and scope that saw its price decline from almost $20,000 all-time in mid-December last year, to around $6,370.